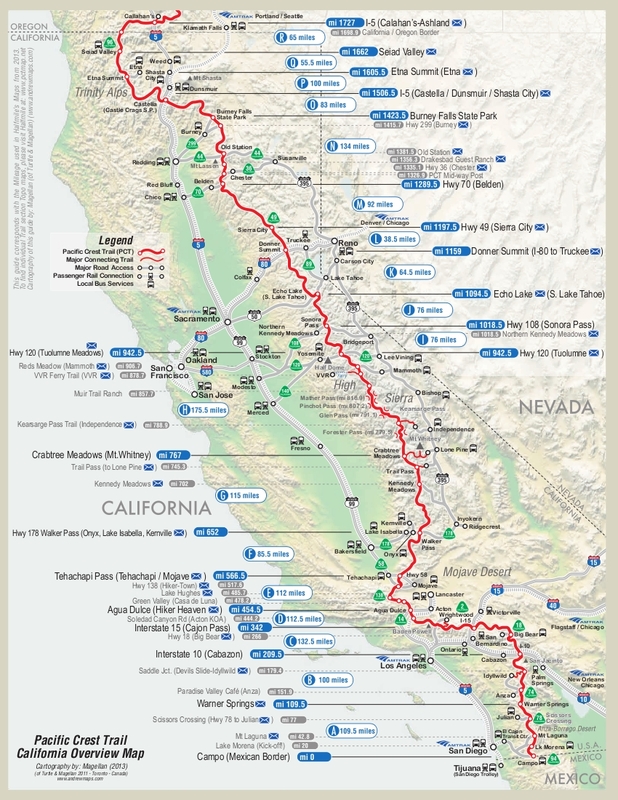 PCT Itinerary | Scott & Marijke's Blog! We are hiking from south to north, which is the direction most end to end PCT hikers travel. Below is a overview map, showing common resupply points (indicated with a little blue envelope) where boxes with food or other gear can be mailed to a Post Office or other location that will hold packages. We are planning on using some but not all of the points listed on this overview map for resupply. Want to send us a care package? … Priority Mail is the preferred method. It’s quicker and more reliable, but also more expensive than Parcel Post. If you can fit a resupply into a flat rate box, you may save money. If the box is traveling a short distance, regular Priority Mail may be less expensive than Flat Rate. Do the math. Some locations, noted in the itinerary below, ONLY accept UPS. We are mailing resupply packages to both post offices and private businesses. * For Post Offices, mail your package general delivery. (Scott & Marijke Weaver; General Delivery; City Name, State; Zip Code). * The general policy is that a package will be held at a PO for up to 30 days. In reality, it varies but it’s usually at least that long. 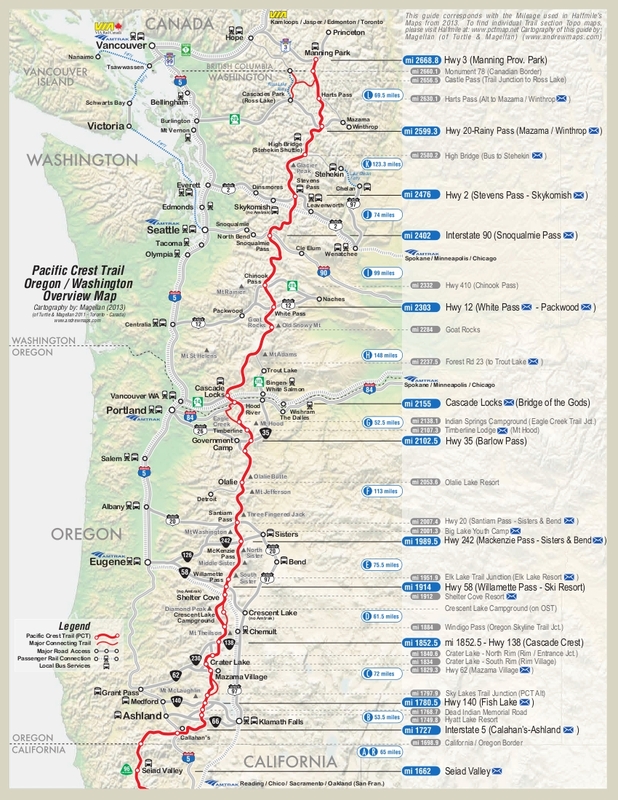 * Write “Please hold for PCT hiker” and our “ETA” or estimated date of arrival. * Resupply locations get a LOT of PCT packages. Make yours stand out by writing “WEAVER” in bold on the sides of it, and draw a big STAR with a sharpie pen! Thats what we will as the Post officer to look for.. Thanks! * Allow plenty of time for shipping and handling. Dates below are approximate..we could get to a place a week(or 2?) early or late depending on our actual pace on the trail. We are doing a combination of “buy as you go” and sending ourselves mail drops ahead of time. 942 Tuolumne Meadows 06/22/13 Buy 10 154 Includes 20 miles to do half dome and to hike down into the Yosemite Valley. 1094.5 South Lake Tahoe 07/02/13 Buy 7 103 Get Balu!! 2107 Timberline Lodge 09/07/13 Buy 3 48 Meet the parents here! Resupply in Welches. 2663 Manning Park, BC 10/08/13 done!